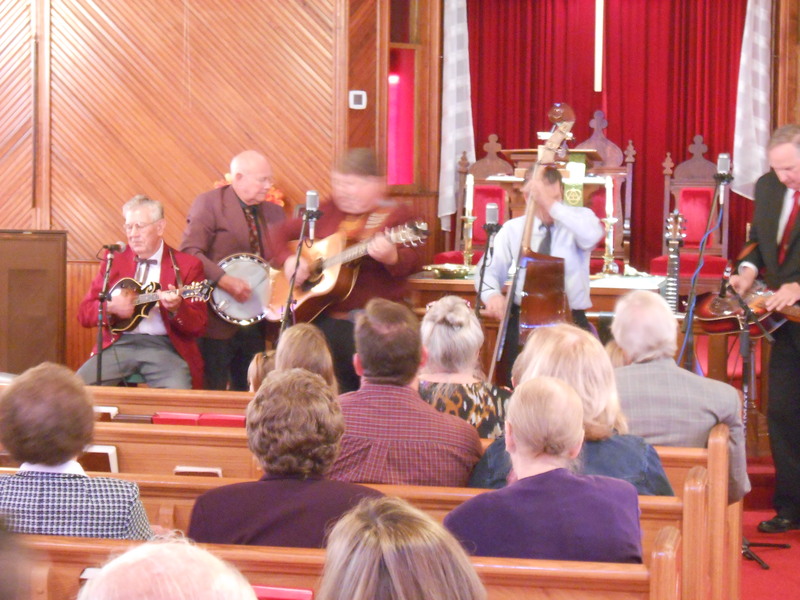 What a great day we had at Fletcher’s Chapel on Homecoming Sunday! Here are a few photos of the day’s activities. You can click on a photo for a larger view. This entry was posted in Fletchers Chapel on 10/30/2013 by admin. This entry was posted in Fletchers Chapel on 10/26/2013 by admin. This entry was posted in Fletchers Chapel on 10/25/2013 by admin. It has been two days or more since my last post on Day 5. 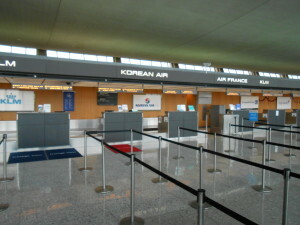 I’m not quite sure how long it has been since Susan and I landed at Dulles airport this morning (Thursday) at about 11:00 a.m. By the time we made it through customs, retrieved our luggage, and took a short ride to First Korea UMC, we hit the road at 12:30 p.m. and got back to the Fredericksburg area at around 1:45 p.m.
Our plane took off from Incheon Airport at 10;30 a.m. Thursday morning. 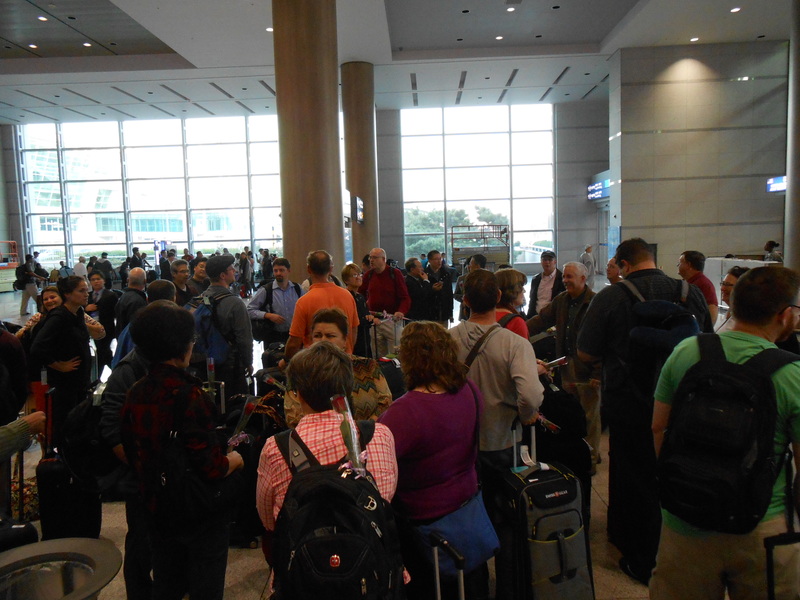 We landed in Dulles at about 10:55 a.m. Thursday morning. So our flight was about 25 minutes long! Well, the flight was actually about 13.5 hours long but we actually gained a day with the time change. Of course, we lost a day when we arrived in Korea last week. So we are back home now, hoping that the jet lag won’t interfere with sleep tonight. We have been up for about 30 hours as I type this. I want to catch you up on our final two days in Korea, Lack of sleep and free time caught up with me by Tuesday. 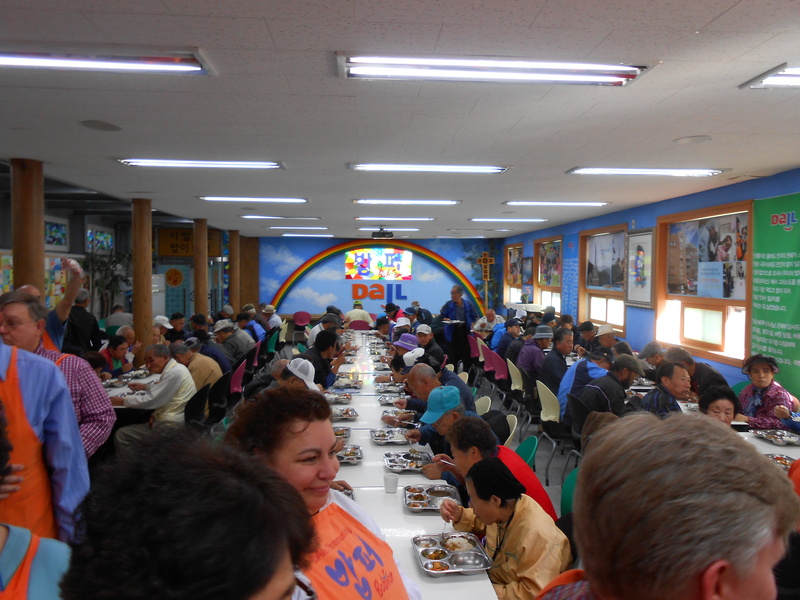 After the early morning prayer service and breakfast, we returned to Seoul to visit Dail Community. Dail Community was founded by the Rev. Ii-Do Choi. Rev. Choi began his ministry when he saw the same homeless man in the street for several days. One day Rev. Choi asked the man how long it had been since he had eaten. The man held up 4 fingers. Rev. Choir asked him, “Four what? Hours?” The man replied, “No, four days.” So Rev. Choi took the man to a local restaurant and bought him a meal. That experience led Rev. Choir to offer Ramen noodles to the homeless at lunch time. However, in Korea rice, not noodles, is considered a proper lunch. So Rev. Cho decided that he was going to serve rice to the homeless one day and that would be the end of the ministry. But the local people begged him not to stop but he could not afford to purchase enough rice to feed more than 100 people a day. But God had other plans, and contributions kept coming in, so for the next 15 years, Rev. Choir continued to feed rice to the homeless. This was all done outdoors. There was no building, no kitchen. Eventually Dail was given a building to house their feeding program and the community soon open a small hospital for the poor. Today they feed an average on 1,000 people daily. After helping serve lunch we toured the hospital and the Rev. Choir hosted a lunch of traditional Korea food. 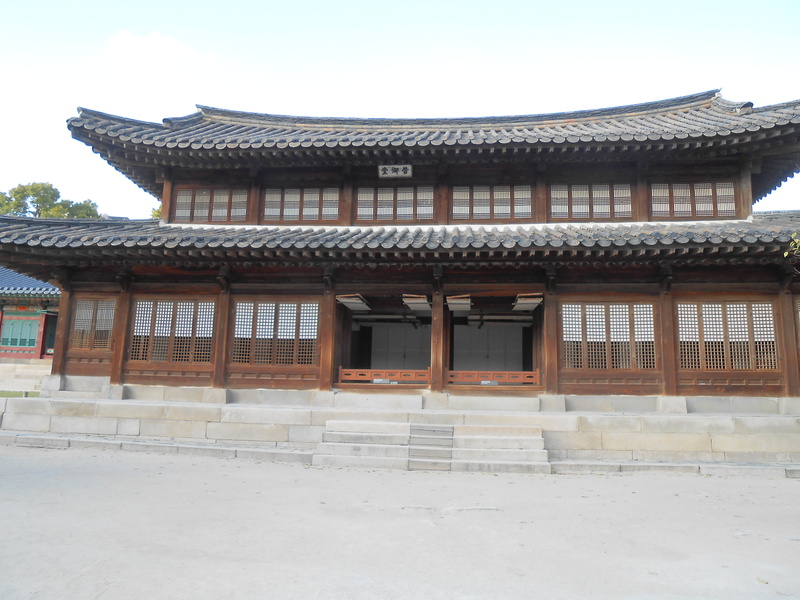 In the afternoon, we toured Deoksugung Palace which is one of the Five Royal Palaces of Seoul. We arrived in time to view the changing of the guard ceremony. We attended our last 5:00 a.m. prayer service, then we met as a group to talk about our experience with the service. 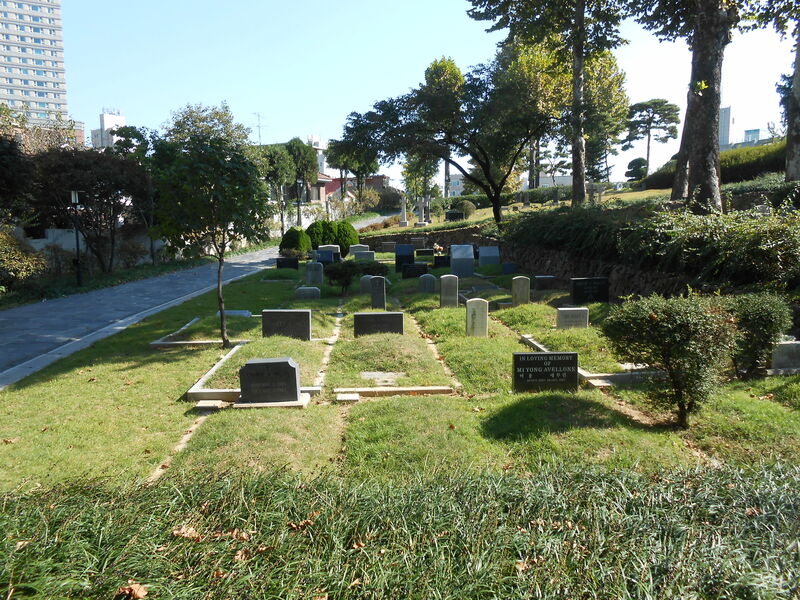 After breakfast, we returned to Seoul to visit 100th Anniversary Church and the Yanghwajin Missionary Cemetery. The missionary cemetery contains the remains of about 119 foreign missionaries. In 2007, 100th Anniversary Church was established near the grounds of the cemetery. Part of its mission is to take care of the cemetery and share its history. We toured the cemetery and the mail church building. At the end of the tour, the church hosted a special luncheon for the group. Later we finally hard a little time to be tourists as we visited the neighborhood of Insadong for about 90 minutes of shopping. After the shopping was over, we boarded the bus for our last meal at the church, then we attended the Wednesday Evening Worship Service. After the service ended, we met in the Fellowship Hall for a time of farewell with our Korean brothers and sisters. The next morning we would need to board the bust at 6:30 a.m. for the return trip to the airport. This entry was posted in Fletchers Chapel on 10/24/2013 by admin. 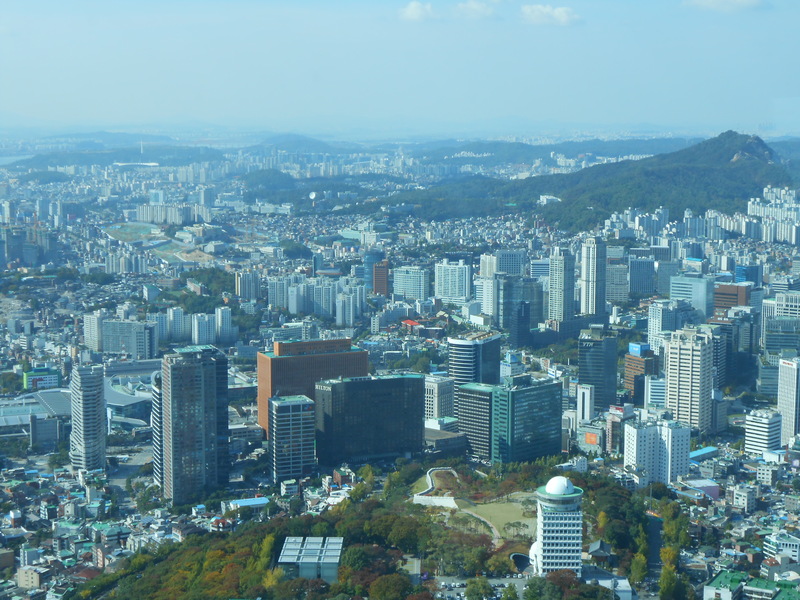 It was a gorgeous fall day in South Korea on Monday, October 21 – sunny with highs in the upper 60’s – in fact, it was a great day to look out on Seoul from the top of a tower but more about that later. 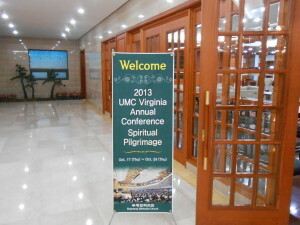 When the lecture ended we boarded the bus for the drive to the capital city of Seoul. The drive took about an hour. 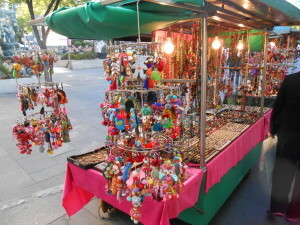 Our first stop was Seoul Tower. The city of Seoul is divided by the Han River which runs east and west through the center of the city. 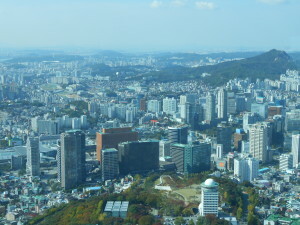 The Seoul Tower is north of the Han River. It is 777 feet tall and is 1,574 feet above sea level. The weather today was perfect and you could see for miles and miles on the observation deck. The tower was built in 1969 as a communications tower. Fiver television stations broadcast their signal from the tower. 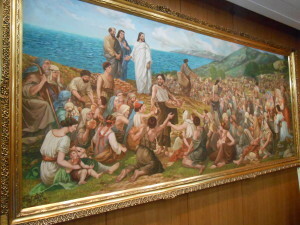 After a lunch break we visited Jesus Village Church in the Chun Cheon neighborhood in Seoul. Jesus Village Church is an Anabaptist congregation based on New Testament principles. It uses a cell church model, follows the leading of the Holy Spirit in worship and encourages all members to be engaged in ministry according to their gifts. Plural leadership and service in society are important aspects of community life at Jesus Village Church. 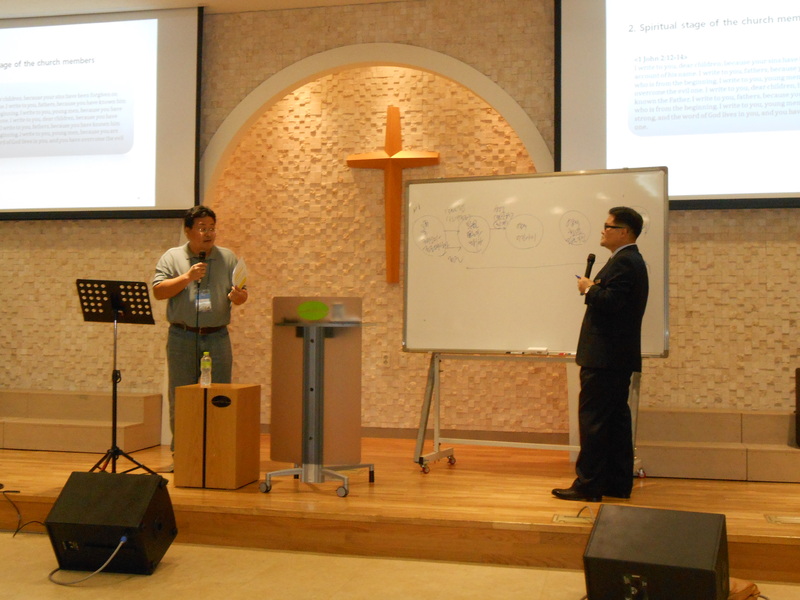 Leaders in the church include Daniel Ahn, Sung-Do Cha, Sang-Uk Nham, Il-Hwan Kim and Tae-Min Kim. Jesus Village Church officially began on the first Sunday of 1996. The vision for the formation of this fellowship of believers was preceded by three years of intense study on the nature of the church by Christian professionals who longed to rediscover the power and spirit of the New Testament Church. They felt strongly drawn to the Anabaptist Church tradition as the model closest to what they desired. Jesus Village Church is an associate member of Mennonite World Conference. The church goes beyond the walls of the church out into the community and offers help to its neighbors in tangible ways. 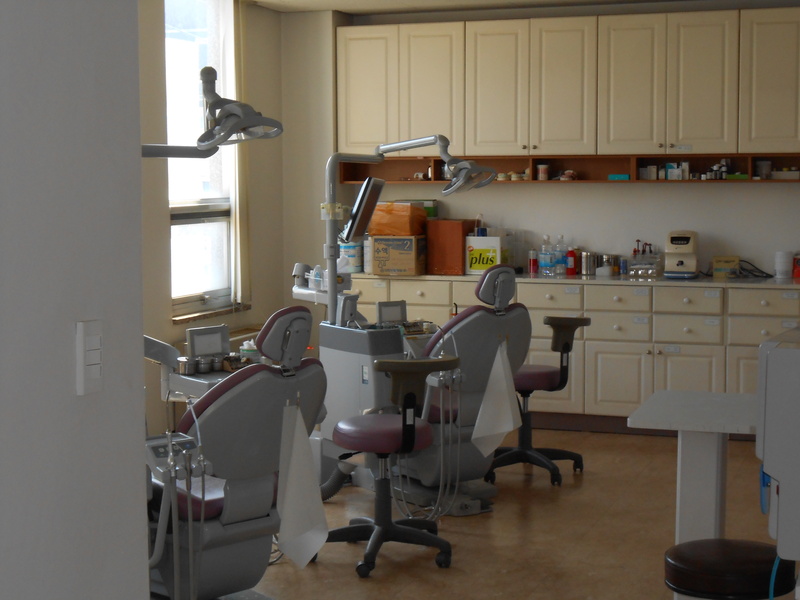 Some of the programs we visited included a day care center, thrift store, a high school that specializes in teaching music, a nursing home for dementia patients, free legal clinic, and a coffee shop. Church members staff these places of business and all services are offered at no charge. After dinner heavy traffic delayed our return to the church until about 8:45 p.m. It was another great day in Korea. This entry was posted in Fletchers Chapel on 10/22/2013 by admin. Today we spent the entire day at Bupyeong Methodist Church. The day began with the 5:00 a.m. early morning prayer service. The Rev. 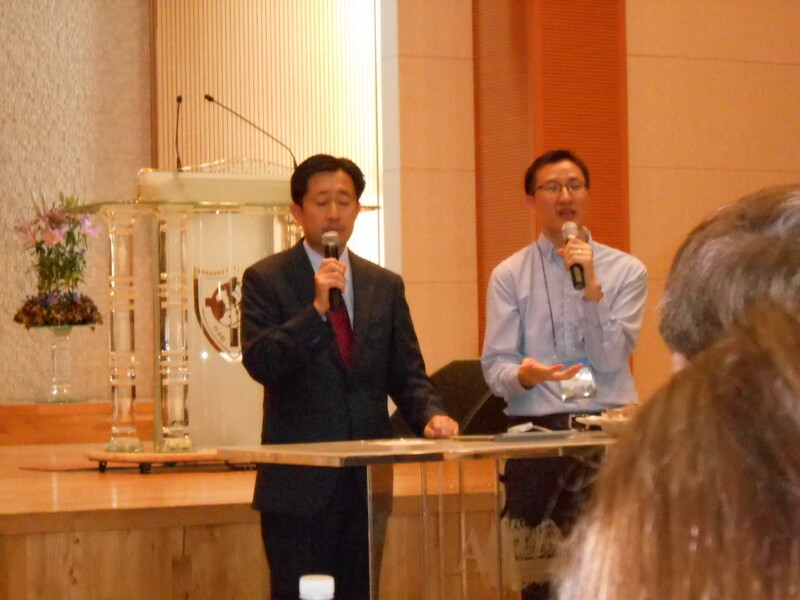 Seong Young Jeong delivered a brief message on Proverbs 16:20, “Grace Comes Down to Us as We Listen Carefully.” Rev. Jeong reminded as that part of prayer is listening to God, not just talking. When we listen to God, we need to act on what we hear. The thirty minutes of prayer that followed was a great joy. What a blessing prayer can be when more than a thousand voices unite. After breakfast, we took a tour of the church building. The present church was built around 1991. 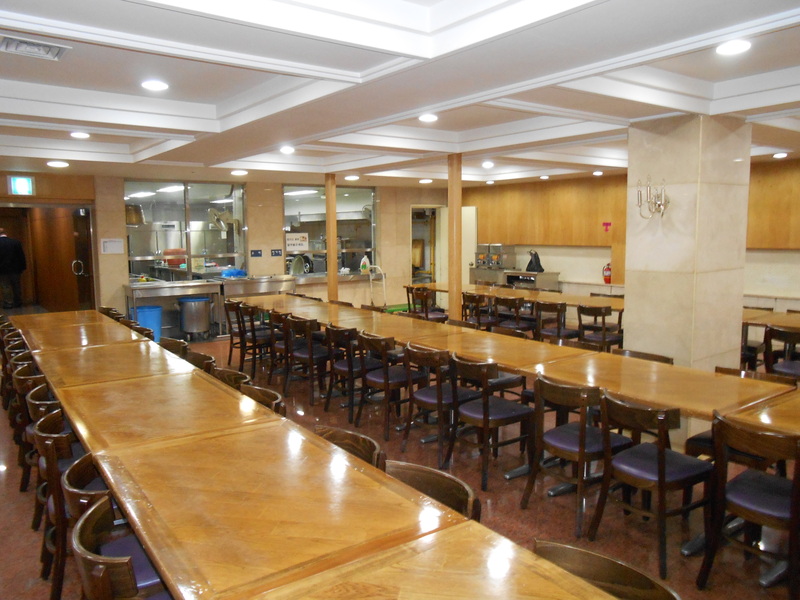 A new sanctuary, dormitory, cafeteria, fellowship hall, meeting rooms, and administration rooms were dedicated in 2003. Due to the need to maximize space, the church has a two level basement parking garage that can handle about 500 cars. There is also a parking tower that will hold 30 cars and a separate parking area for the staff. The children come to Sunday School at 9:30 a.m. The youth worship service is held while the younger children are in Sunday School. There were at least 500 youth present for worship. The adults do not attend Sunday School classes because they are in cell groups which might on Friday evenings. 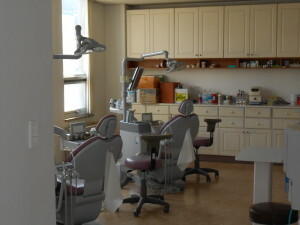 These groups consist of 5 – 10 members and they typically meet in private homes. Each group studies the same Bible lesson in a given week. On Sunday mornings worship services are held at 9:30 and 11:30. The services are the same but a different choir sings at each service. After our tour we were seated for the 11:30 service. Our group of 40 clergy sang “Blessed Assurance” as a special anthem. We sang the third verse in Korean. Rev. Dan Elmore served as our choir director and he did an excellent job. It was a bit nerve-racking singing in front of more than 2,000 people. After the service we were served lunch. 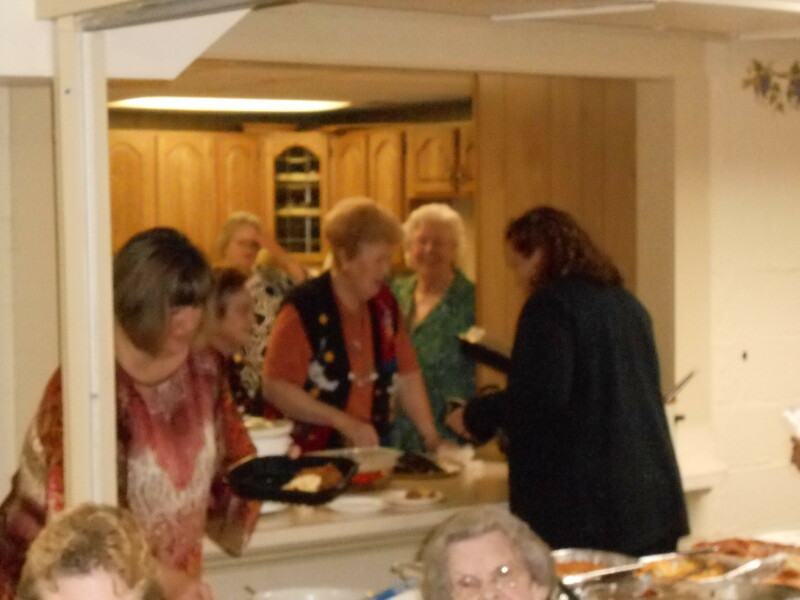 On Sundays all church volunteers are served a meal after the 11:30 service. 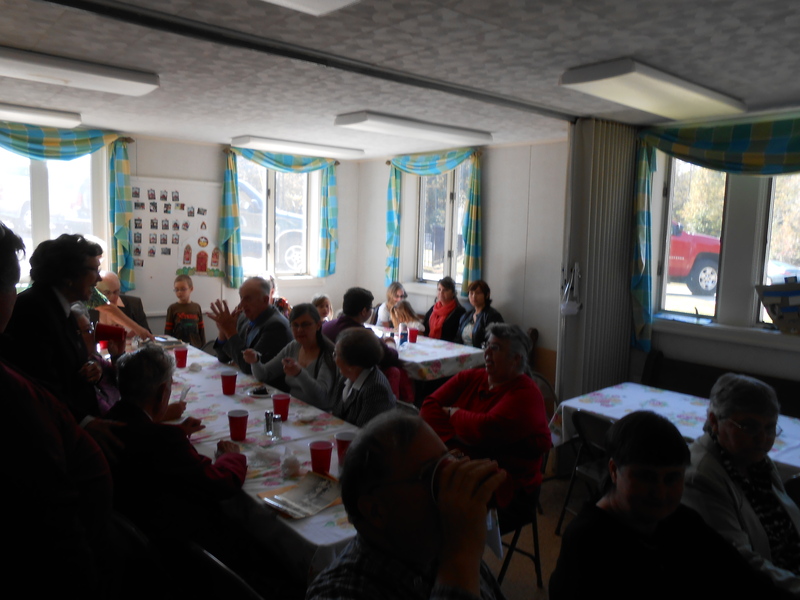 So we joined the church volunteers for lunch. After lunch, Rev. Hong’s wife shared her personal testimony with us. We had a two hour break in the afternoon, then we were treated to a “Mini-Concert” in the fellowship hall. It was a real treat! For about 75 minutes, we listened to world-class singers and musicians offer their talents. 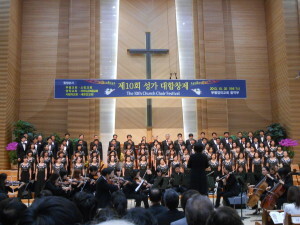 The music was fantastic and we were stunned by the number of musicians Bupyeong Church has produced. After dinner we attended the Sunday Evening Service which began at 7:30 p.m. We were in for a special treat this night since this service also incorporated the church’s annual choir festival. Six choirs each shared two songs and the concert ended with the combined choirs singing Handel’s “Halleluia” chorus. Just image hearing nearly 1,000 singers joining together to perform that glorious piece of music! After the evening service, we attended a reception for the choir directors and some local VIP’s. When it was time to settle in for the night, we were all tired but blessed by all the wonderful worship and music of the day. This entry was posted in Fletchers Chapel on 10/21/2013 by admin. It was another amazing day in South Korea! We began the day with the Early Morning Service. Congregational singing begins at 4:45 a.m. At 5:00 a.m. there is an opening prayer, a hymn, scripture reading, and a sermon. Today’s text was Ezekiel 37:10 and the sermon preached by the Senior Pastor, Rev. Eun Pa Hong was titled “From Dry Bones to Large Army. We listened to the message through an interpreter who spoke to use through personal listening devices like the ones used in many churches for those who have difficulty hearing. After the message concluded, the lights in the sanctuary were dimmed and the congregation entered into a time of prayer. In Korea, these morning prayers are offered out loud by each person. Imagine the sound of more than 1,000 people prayer aloud together! It is quite incredible to experience. A melody line from a familiar hymn plays as all pray together. After about thirty minutes, the music fades out, the lights are turned up, and the people start to leave. The service lasts about an hour total but many stay in their seats and remain in prayer for as long as they wish. After a short time of rest followed by another excellent breakfast prepared by the women of the church, we attended a lecture by Pastor Hong on Korea’s history and the revival and growth of the Korean Church. Protestant Christians account for about 25% of the total population. 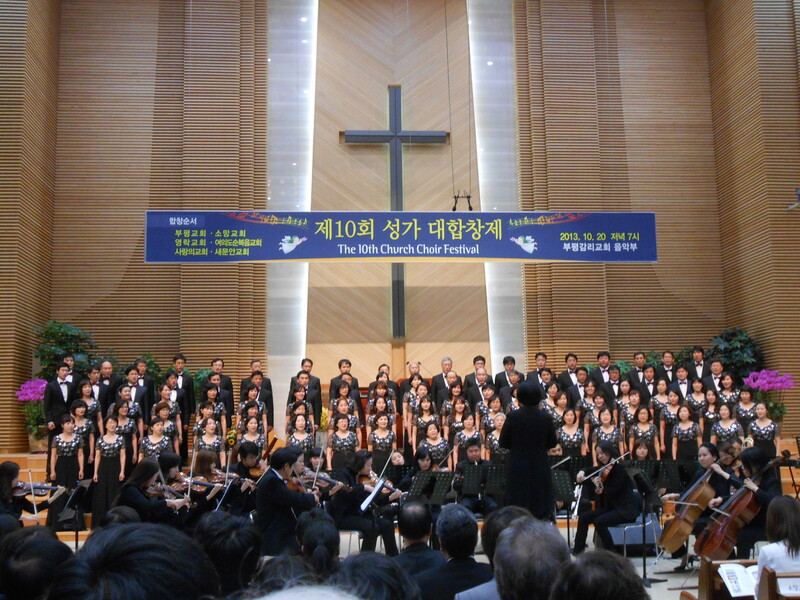 The Korean Church grew rapidly from 1960 through 1985. 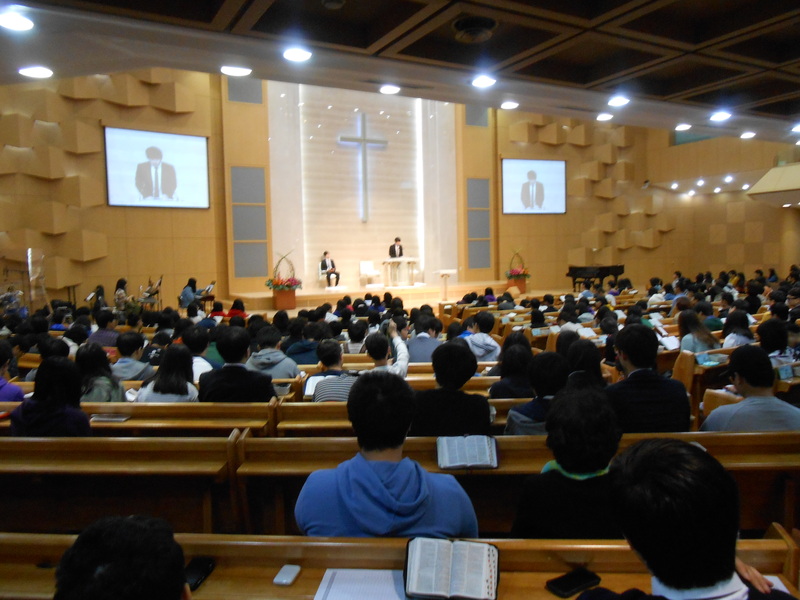 Bupyeong Church places high demands on it members and most members attend the daily early morning prayer service. This week the church is celebrating a special week of evangelism where church members are asked to invite their friends and family to church. Sunday, October 20 is the culmination on the week and special evening services are planned for the celebration. 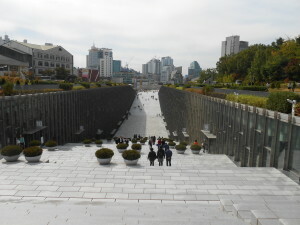 Next, we boarded a bus and drove to the capital city of Seoul which is about an hour away. 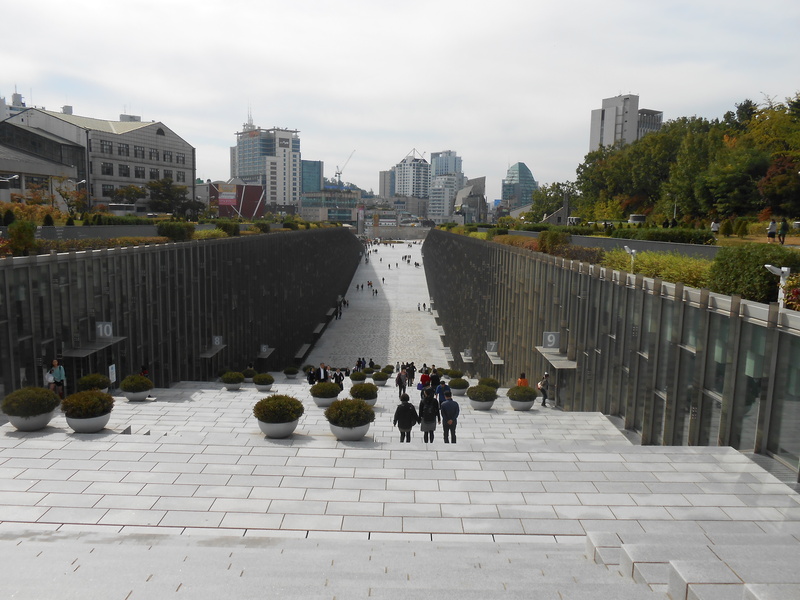 Our first stop was to Ewha Women’s University in Seoul. The school was founded in 1903 by Mary F. Scranton who was a Methodist missionary to Korea. Mrs. Scranton began the school in her home. It was the first women’s only school established in Korea. Over the years it grew from a middle school to one of the largest women’s universities in the world. Today there are more than 22,000 students who attend Ewha Women’s University. The United Methodist Women provided much financial support and prayer to the University over the years. After lunch we made a short trip to Yonsei University in Seoul. Dr. H. N. Allen was an American Presbyterian missionary who served as the Royal Family doctor. At the king’s request, Dr. Allen established a hospital. 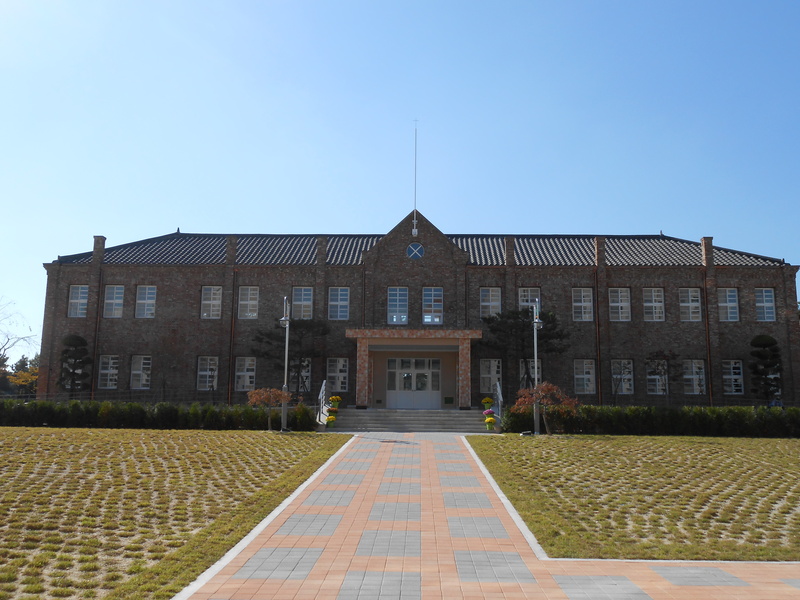 In 1886, 16 students were selected and the school was opened to train Koreans in modern medicine and Jejungwon Medical School was established. In 1905 the school was renamed Severance Hospital Medical School. In 1915 another Presbyterian minister, Horace Underwood, established Chosen Christian College which was later renamed Yonhi College. In 1957 the two schools merged and took the name Yonsei University. Today Yonsei University has over 37,000 students enrolled in one of more than 30 undergraduate and graduate schools that make up the university. 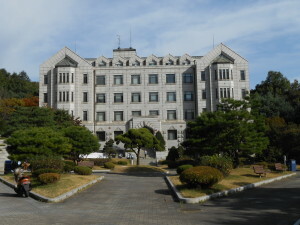 It is one of the most prestigious universities in South Korea. The school still maintains its identity as a Christian college although non-Christians are admitted to the school. Students are required to earn one credit for chapel attendance before they can graduate. We left Yonsei and returned to Bupyeong Church where dinner awaited us. After two long days of travel, the group was glad to get an early night’s rest. This entry was posted in Fletchers Chapel on 10/20/2013 by admin. This entry was posted in Bulletins on 10/19/2013 by admin. Hello again from Pastor Mike in South Korea! After a long day of travel, we settled in for a good night’s sleep. The church has about twenty hotel-type rooms for housing guests. The rooms are a little smaller than what Americans might expect in a typical hotel but since these rooms have the basic necessities (i.e. no television, no computer desk) the rooms are more than adequate for two people. The accommodations are quite nice and the church does a wonderful job of maintaining the space. 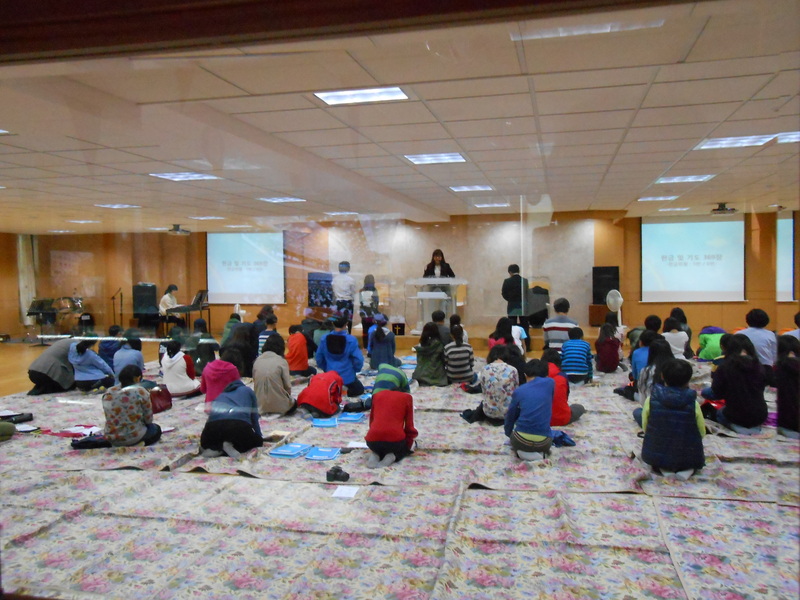 Instead of beginning the day at 5:00 a.m. with morning prayer, the staff at Bupyeong Church took mercy on us and let us sleep in since day 2 would be a long day and we would need all of energy while still adapting to the time change. Breakfast was served at 8:00 a.m. and what a meal it was. Members of the church arrived at 6:30 a.m. to prepare it. It was a mix of American and Korean breakfast foods and plenty of coffee and hot tea for the group. At 9:00 a.m. we boarded two tour buses which would serve as our base for the day. We headed south to visit Songtan Gipeun (Joyful) Church in Pyeongtaek, Gyunggi about an hour away. The church was established in 1985. The present Senior Pastor, Rev. 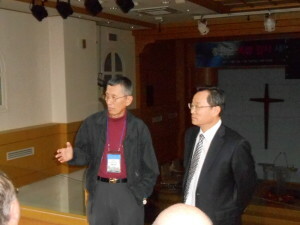 Woong Seok Son, came to the church in 1988. The congregation was meeting in a rented basement with only a handful of members. Rev. Son was 28 years old when he arrived and he wondered why God was send him to a church that seemed likely to fail. Then God told him to have patience. He spent the next five years working with a handful of families with young children who would become leaders in the church. Today the church has 2,000 members and they are building a cultural center – perhaps something like a family life center – which the church plans to use to better connect with the community. 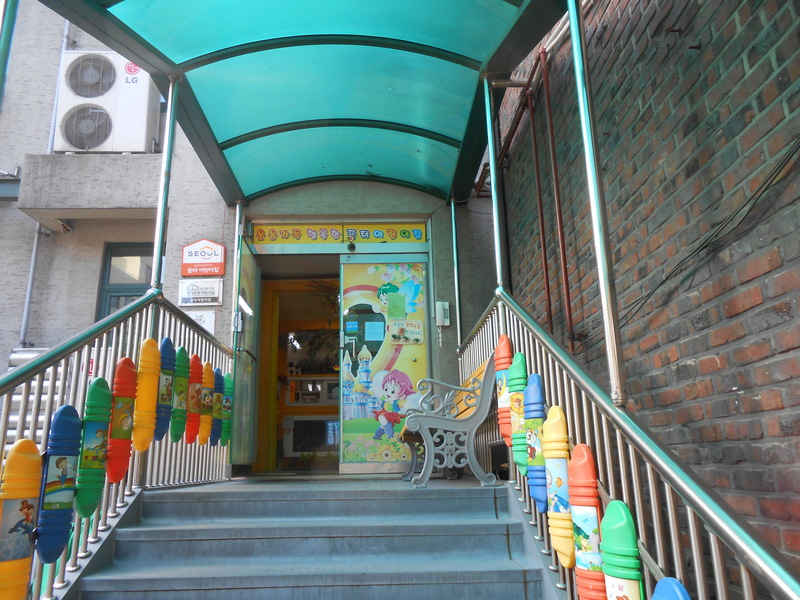 The church runs a pre-school. There is also an excellent children’s library which is open to the community. The church reaches out to immigrant workers who are often mistreated. After a lunch break and another hour’s drive south, we arrived at Mokwon University in Daejeon City. The school was founded in 1945 by Charles D. Stokes, an American Methodist missionary. The United Methodist Church provided much financial support in its beginning. Mokwon is one of three Methodist seminaries in Korea. Today the university has over 13,000 students in eight undergraduate and 5 graduate schools. The seminary has educated over 3,000 ministers. Currently, there are about 700 students enrolled in the seminary. 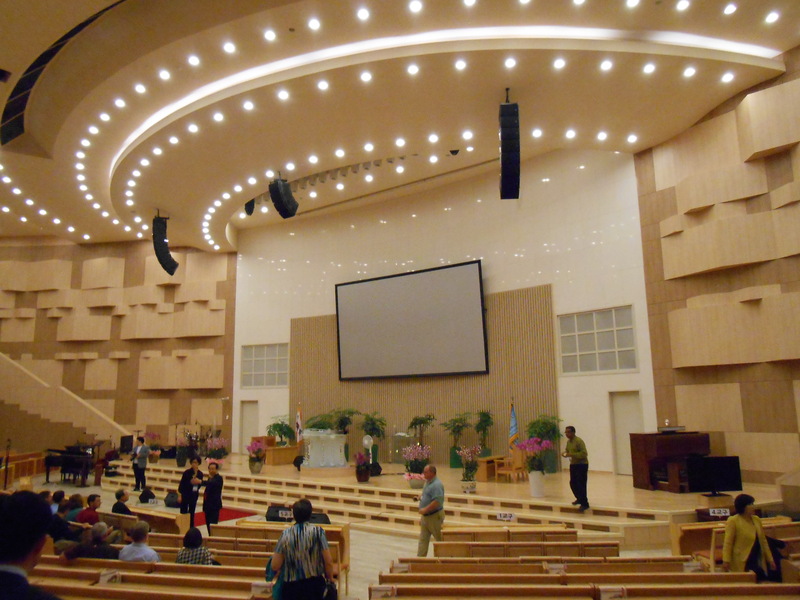 Our next stop in Daejeon City was the Church of Heaven’s Gate which was also established in 1945. The church has relocated three times because of church growth. The current sanctuary was dedicated this year and cost $40 million to build and seats 3,000 for worship. Bishop Gi Bok Lee is the Senior Pastor. Bishops and District Superintendents in the Korean Methodist Church continue to serve churches in addition to their other Episcopal duties. Our final stop in Daejeon City was Doonsan First Methodist Church which was established in 1993 by the Rev. Sang Wook Moon. Today the church has over 5,000 members (2,000 young adults). The current church is a ten story building in the center of the city which cost $23 million to construct. The sanctuary seats about 3,000 for worship. The center of its ministry is a program called “40 Day Discipleship Training.” For forty consecutive days the participants agree to come to church nightly at 8:00 p.m. for a 90 minute Bible study and prayer time. This ministry serves to help people discover God and the power of the Holy Spirit in their lives. This experience encourages the participants to invite others to the church. Cell groups meet weekly in private homes for Bible study and prayer. 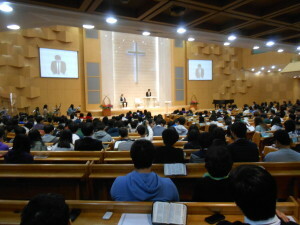 After a dinner break we returned to Doonsan Church for the Friday Young Adults Service which began at 8:00 p.m. 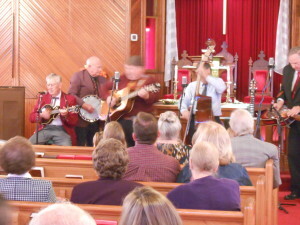 The service featured a rock and roll style four piece group for its praise band. The praise band along with a group of eight singers opened the service with about 30 minutes of praise songs. The young crowd was very energetic. There were at least 2,000 in attendance. The service showcased the talents of young people as evidence of God’s gifts working in their lives. We saw people show their skills at tae kwon do, painting, singing, and a personal testimony of one young lady told of how she accepted Jesus into her heart. 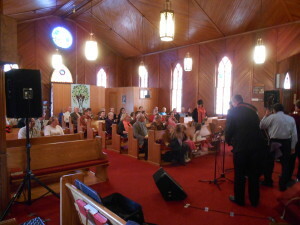 The crowd’s enthusiasm continued to build throughout the service. 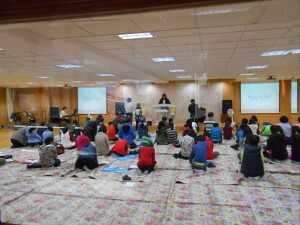 The preacher was about to come out and give the message but it was 9:15 p.m. and we a 2 hour drive back to Bupyeong Church so we left the service early. As we walked out, it was hard not to be touched by all the people moved by the service. It was a worship service that will be hard to forget. We boarded the bus after a long day filled with many amazing sights and stories. We finally settled in for bed just before midnight. This entry was posted in Fletchers Chapel on 10/19/2013 by admin. 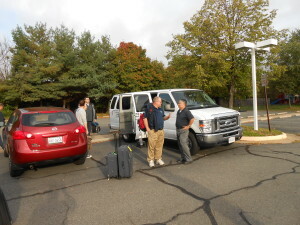 Our group assembled at the First Korean United Methodist Church in Herndon, VA on Wednesday morning and at 9:30 a.m. three vans carrying 40 pastors and their luggage departed for Dulles airport. 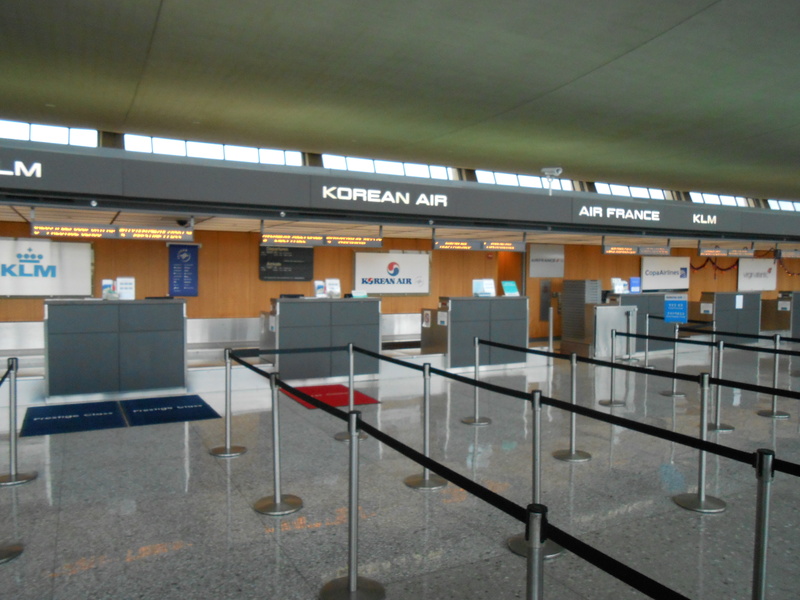 Our flight left on time at 1:30 p.m. and about 14 hours later we landed at the Incheon airport. After clearing customs and retrieving our luggage, we were welcomed by four pastors on staff at Bupyeong Methodist Church. 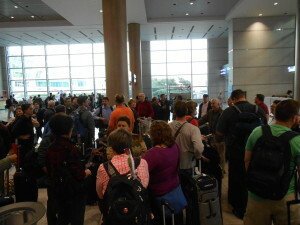 We arrived in Korea at 4:30 p.m. local time (3:30 a.m. back in Virginia). One bit of sad news to report, one of our clergy with a passport from another country did not have the required visa to allow him entrance into the country. As we boarded the bus to leave the airport, a prayer was offered for our clergy friend. Unfortunately, despite the efforts of Bishop Cho and Rev. Won Un, a temporary visa was denied and our colleague was sent back to the United States. Our first stop after a 45 minute drive in rush hour traffic was in Bucheon to enjoy a nice dinner in a restaurant at a local shopping mall. Our pastor hosts reminded us during our ride that in Korea due to over population, cities must make efficient use of space. All buildings tend to have many floors in order to accommodate the residential and commercial needs of the people. The mall was five stories tall with many of the shops you would expect in a typical mall in Virginia — clothing stores, fast food, sit-down restaurants, movie theater, electronics, etc. We enjoyed a nice meal and boarded the bus for Bupyeong Methodist Church. 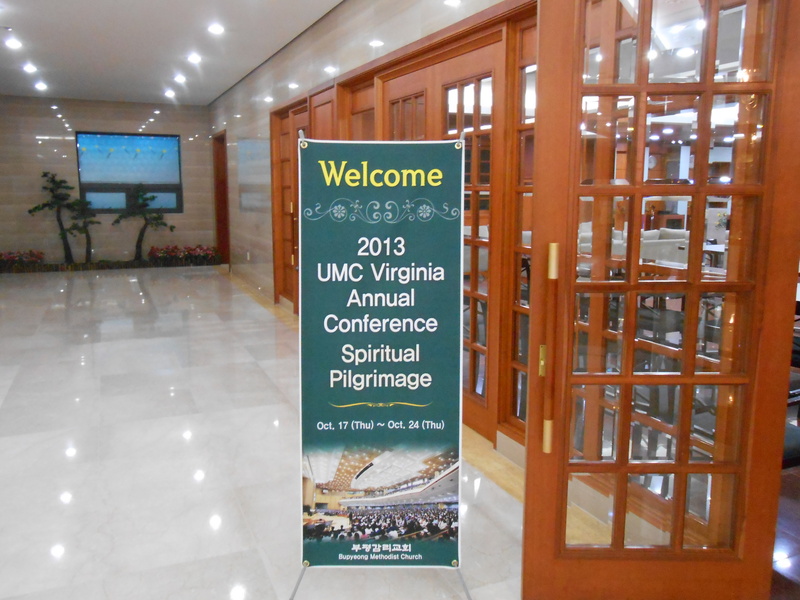 When we arrived, we were greeted by members of the church who applauded as we entered the building. This was quite unexpected but greatly appreciated. What followed was a time of radical hospitality as the senior pastor, Rev. Eun Pa Hong, led a time of orientation and welcome. The staff and lay members went out of there way to make us feel welcomed in their church and country. It was truly something I will never forget. At 9:00 p.m local time, we went to our rooms to settle in for the night. We had all been awake for about 28 hours by this time and looked forward to the rest. Well, it is Friday morning here and we are being called to breakfast. I hope you will check back here again for the latest updates. This entry was posted in Fletchers Chapel on 10/17/2013 by admin.